Chris Hatwig, Vice President of Apexus, the organization responsible for managing HRSA’s 340B Prime Vendor Program, highlights the importance of the 340B program to the MDRP community and beyond, as well as how the MDRP Summit facilitates forward thinking business development and understanding within the pharmaceutical manufacturer community in our exclusive podcast. I think that’s hard to say at this point. A lot of people ask the question about if the Affordable Care Act would have been repealed if it would have had a major impact on the program. We really don’t know. There is ongoing debate on whether, with the expansion of the Affordable Care Act and everybody having supposedly insurance after 2014, that there may be less need for the 340B Program and maybe time has passed the program by; it’s obsolete – no longer needed. I don’t think that’s the case at all because the Affordable Care Act, there is probably still going to be 40 to 50 million in the country (assuming the Act was unchanged at all with Congress’s vote), there would still be 40-50 million uninsured patients in the country anyway. And then on top of that, even with insured patients and the Affordable Care Act, we all know that many patients (even if they have insurance) they are under insured or they are unable to pay for their copay. So, it’s a choice between whether or not they’re going to eat or whether they’re going to get their medications or get healthcare. And many opt to eat versus getting the healthcare. So the 340B program is needed regardless of what was going to happen with the Affordable Care Act. And after the final vote, the one thing that did change was the requirement for the Medicare Programs to engage. We could see and are already seeing many of the program expansions in doubt now so Medicaid is covering many of the uninsured patients so that puts a lot of these patients in question as to where their healthcare is going to come from. So, 340B and safety net institutions are probably --- again, the role is going to be very vital for to providing healthcare for all patients in the country. - What it is about the 340B Program that is challenging pharmaceutical manufacturer’s right now? - What can the industry prepare to expect from OPA in the coming months? 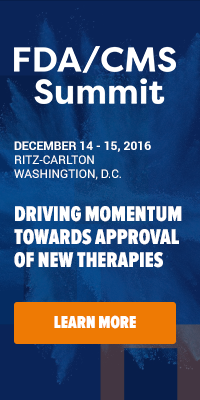 - Why should (our audience) attend the MDRP Summit? For the full interview, download the audio and transcript here. As a reader of this blog, you receive an exclusive discount of 25% off of the standard rate when you register to join us this September 10-12, 2012 in Chicago, IL when you register and use priority code XP1758BLOG. Do you have any questions about the event? Feel free to contact Jennifer Pereira.